How big the heart of Blue whales? In a PBS/BBC video describes the unusual findings. In the show, look how big the size of the heart, approximately 1.5 m x 1.2 m x 1.2 m. This is not really surprising, because the so-called blue whale is the largest living mammal on this planet. In a video statement was written comparison of the blue whale with a Argentinosaurus - the biggest dinosaur of the Mesozoic period that weighs approximately 99 tons. That mentioned the average weight of a blue whale. In the show, Jacqueline Miller of the Royal Ontario Museum to start with shows the size of the heart of a variety of animals, ranging from home-based rat heart, heart turkey bird, and then the heart of a blue whale. 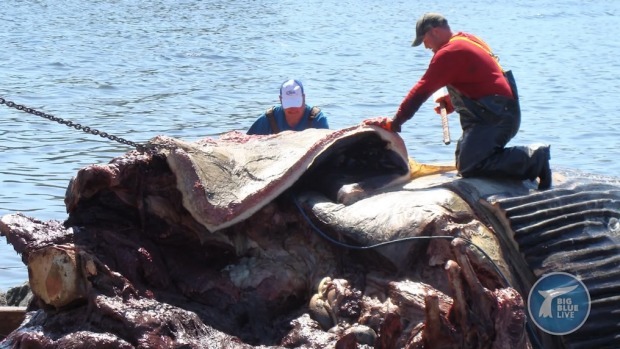 Experts from the Royal Ontario Museum to get the heart of a blue whale carcass which is then dissected through the lungs towards the left. One expert explained in the video, that pool of blood in whale carcasses that reach as high as his waist. Not only that, it takes four people to push the heart to get out from the inside of the carcass. 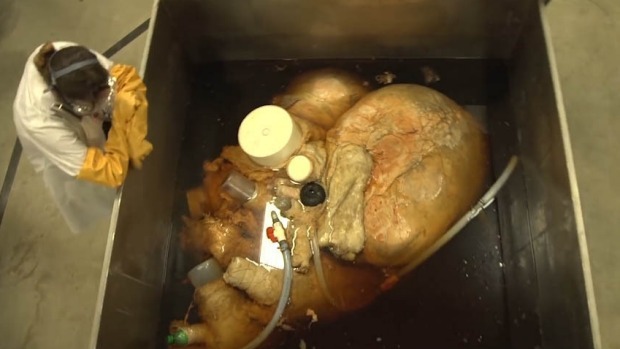 Well, look how big the animal heart in the following video.